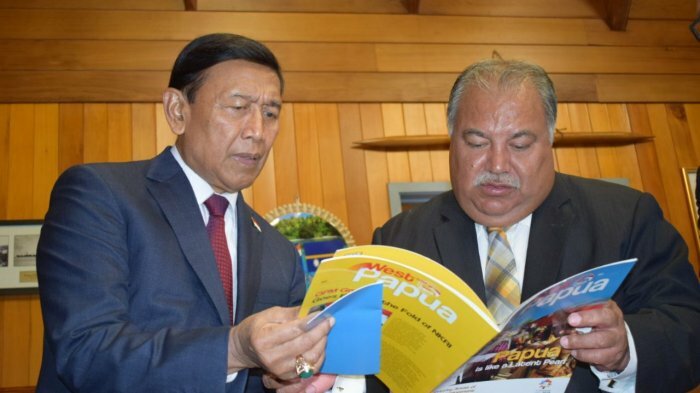 Reported from papuanews, a number of countries in the South Pacific region appreciate the Indonesian government's continued efforts to build and develop Papua and West Papua and support every effort made by the government to make people in the region prosperous. "We support every step taken by the Indonesian government to prosper the people in Papua and West Papua," said Nauru YM President Baron Divavesi Waqa after holding a bilateral meeting with Indonesian delegation led by Coordinating Minister for Political, Legal and Security Affairs Wiranto at Government House, Republic of Nauru, Wednesday, according to a written statement received by Antara. He believes that the efforts of the Indonesian government have very good intentions. Therefore Nauru will continue to support and maintain friendships and cooperation with Indonesia. "We Nauru people will always regard Indonesia as a friend. We understand what the Indonesian government is doing to create development for Papua and West Papua, "said Y. M. Baron. Meanwhile, the Prime Minister of Tuvalu, Enele Sopoaga, expressed his attitude not to interfere about the problems in Papua and West Papua. He simply advised that the enforcement of human rights should continue, including cultural rights. "We do not want to interfere with Indonesian policy. We deeply respect human rights, including cultural rights, but Tuvalu has no position to intervene in this matter, "said Enele Sopoaga. In the celebration of the 50th Anniversary of the Republic of Nauru Independence, the Indonesian government also graced the cultural event held by the people of Nauru. Indonesia presents music band from Papua and West Papua which is named Papua Original. According to Coordinating Minister for Political, Legal and Security Affairs, Wiranto, in addition to enliven the celebration of Nauru Independence Day, the art band from Papua and West Papua is also one of the Indonesian government's mission. Because the government wants all countries to stay friendly. "I am bringing art teams from Papua and West Papua in the hope that there is a culture that shows that we are friends. We are different but there are actually sections of the tribes that we can not elakkan, "said Coordinating Minister Wiranto Polhukam. According to him, Indonesia also has a society that comes from Melanesia and Polynesian families and generally resides in the eastern part of Indonesia. "We are the same. So at the time of appearance in the cultural event yesterday we joget together to follow the rhythm of his reggae from the band Papua, "said Coordinating Minister for Politics and Security. "The point is that this mission must result in an improvement, a very good friendship between Indonesia and the Pacific countries that we did not have a chance to touch them," Coordinating Minister Wiranto said.